So, I’ll be honest, when I finally got to Wilshire Boulevard Temple tonight for their Sanctuary Rededication and community concert, I wasn’t feeling the love for anything. It’s been a hectic, arduous, often annoying 48 hours. I got 5 hours of sleep last night. I didn’t get out of work until 4:00 and the service was supposed to start at 5:00. I told Eric to go on ahead and I’d meet him there. Our friends Barbara and Jack were meeting us there as well. Of course, parking was a nightmare. I was grumpy when I found my group in the balcony of the newly restored temple. I started kvetching (I’m sorry, I couldn’t resist) about having to park half a mile away. And then I stopped and looked around the sanctuary and I was kind of speechless: it was stunning. I took a few pictures which I posted to Instagram (feel free to follow me at raybarnhart68), but I really wish you could have been there to see it. A few minutes after my arrival, the two-hour service started. 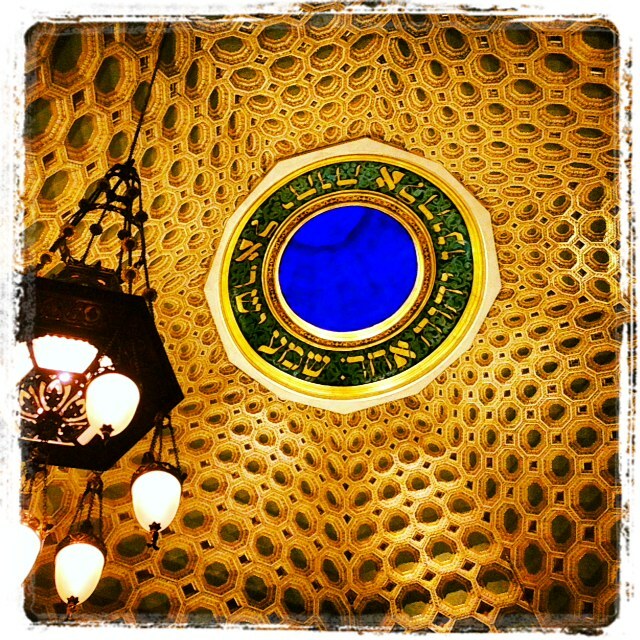 Different guests and members of the congregation talked about the temple, the previous rabbis, interfaith relations, Los Angeles. There were prayers. There was music from six different choirs including the Wilshire Boulevard Temple Choir, the Los Angeles Children’s Chorus, the Sacred Praise Chorale of Faithful Bible Church. And then the service closed with Burt Bacharach and all of the choirs singing What the World Needs Now. I also posted a snippet of that to Instagram. After the weekend I had, there was a part of me that dreaded sitting in a pew for a religious service, and yet, I left invigorated. I shed a tear when Rabbi Steven Leder became a little emotional as he introduced his mother. What a big day this was for him, this respected religious leader and yet, at heart, like the rest of us, he’s a child who just wants to make his parents proud. It was an evening filled with blessings for people of all faiths and among those blessings was being able to sing along with Burt Bacharach to one of his most iconic, beloved songs. Btw, he’s 85 and spryer than me, not that that’s saying too much. His life has certainly had its joys and sadnesses and I couldn’t tell you how much his faith has played a role in his life, but it was a gift for him to share his time and talent with us, with me and Eric and Barbara and Jack, tonight. And certainly, the song couldn’t ring truer, love is exactly what the world needs, now and always. Most people who stumble upon this blog find it through Facebook, but people also sometimes find me through google searches. I’ve reposted all of the known searches that people have made in the last few months. Some are very specific and others are seemingly random. As a person who enjoys internet sleuthing as much as the next guy, it’s nice to know that I’m not the only person who has googled “ralph meeker gay” and “masterpiece board game” and “jessica tandy i’ve gone blind.” Is there a lesson in all of this? Probably not, except maybe that at least 25 people (26, if you include me) would like to go on their computer and find a picture of Richard Gere in a Speedo. Sometimes you have a story that has so much ick attached to it you wonder if you can even tell the whole thing. And this is coming from a guy whose last blog post was about pretending to be Olivia Newton-John while rollerskating in his garage. I’ve sat on this story for a good 24 hours. I went to work today and told no one because it’s really too embarrassing, but hey, maybe this will make you feel better about your life. 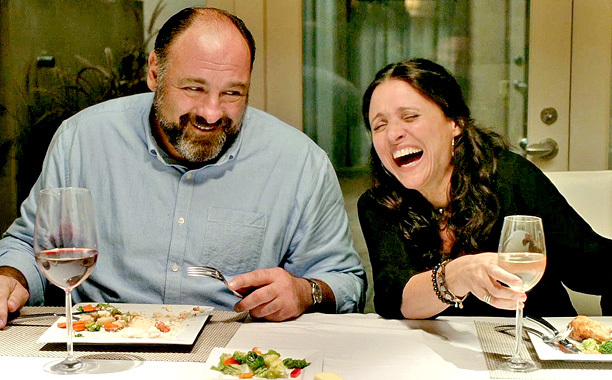 Last night, I went with my friend Vinod to a screening of Enough Said, the new Nicole Holofcener film starring Julia Louis-Dreyfus, James Gandolfini and Catherine Keener. It’s a wonderful, funny, sweet, heartbreaking film and I loved it every bit as much as I loved every other one of her movies. There was a Q & A with Nicole and Julia after the screening and for the life of me, I tried to think of a smart, cute question, but I couldn’t think of one, so I didn’t raise my hand. Now I have a history of embarrassing myself with Nicole Holofcener, it’s been documented here. And I really wanted to present myself to her in a way that would exonerate myself of the crazy attached, not that she would remember (actually, she might remember). After the Q & A, a few people went to the front to shake hands with the women. Vinod wanted to meet Julia and he convinced me (’twas not hard) to go with him. There was one old guy in front of me who talked to her, no kidding, for 5 minutes about the movie Bell, Book and Candle. Finally, she politely dismissed him and then some guy interjected that they’d met before and they talked for 2 minutes and then a Russian lady told her that she should film something in Russia and then a tall Nigerian woman gave Nicole her headshot business card and then Nicole’s handler came and said she had to take her away. And the whole time I’d waited patiently to tell her that no one loved her movies more than I loved her movies, that we’d lived parallel lives, that she was my touchstone. And this is the super ick part, as she was being ushered away, I told her, in a voice somewhere between normal and bellow, “This is the second time I’ve seen it, I saw it on Wednesday.” Don’t worry, she didn’t hear me, there were too many others doing metaphorical pirouettes, trying to get her attention. Even my friend Vinod didn’t hear me because at that moment, he was getting the most amazing picture of him and Julia Louis-Dreyfus. The only person who heard my awkward statement was me and I immediately became flushed. As Vinod and my friend Amy and I walked to our cars, I felt so sad, so embarrassed. I am that guy. I don’t have an ounce of cool in me. I actually wouldn’t have been able to ask a question because I don’t know how to modulate my voice when I’m talking to famous people. If I were being played in a movie by Zooey Deschanel, I’d get on your nerves a little, but you’d think, she’s just so cute I can’t help but love her, but when the me character is played by, well, me, it’s just not cute. Anyway, that’s my story. I’d say it’s going to be the last time I embarrass myself like that, but clearly, I’m making it worse by telling you. And just so you know, I’m writing this stone cold sober, I won’t even be able to blame Sauvignon blanc or Ambien for this confession in the morning. I do want to say, if you get a chance, go see Enough Said, it’s wonderful. And if you ever get the chance to meet Nicole Holofcener, please bring me along. I per-omise I won’t embarrass you! When I was ten or twelve I’d put on little roller skating shows in my garage. I’d sing my favorite songs while I’d skate in a circle, pretending I was Olivia Newton-John in Xanadu. One such afternoon, my neighbor Mark, who was my age, pulled up on his dirt bike and asked me what song I was listening to. It so happened that, at this moment I was listening to and belting out and figure-eight-ing to The Magic Store from The Muppet Movie. So I told him. “Only fags listen to music like that,” he said and then rode off on his bike, proud of himself for obvious reasons. I loved The Magic Store. When not singing to it on roller skates, I’d sing it standing in front of the mirror, creating new choreography every time. It thrilled me, it understood me, it spoke to me and it inspired me. I did find a home at the magic store. 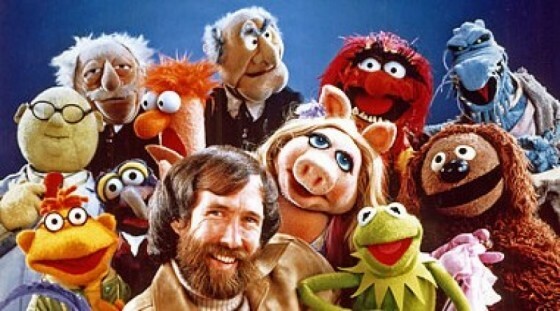 Today is Jim Henson’s birthday. Like many of my generation, he figured prominently to my youth. I started with Sesame Street as a wee boy, and then I remember watching The Muppet Show every Saturday night. I saw The Muppet Movie at least 10 times in the theatre and I don’t know how many more times I watched it on tv. I loved Kermit and Miss Piggy. I loved Ernie. I loved Fozzie. And Remember Emmet Otter’s Jug Band Christmas? I do know why I gravitated to the things that Jim Henson created. He understood the outsider, the person who couldn’t quite pass as normal. Back when I was 10 or 12, I thought there was such a thing as normal. Every once in a while, I’ll still stand in front of a mirror and launch into, “It starts when we’re kids…” And thankfully nothing anyone could ever say to me now would make me turn off my music and take off my roller skates and go inside. The summer between my junior and senior year in Bible college, I interned at a church in Syracuse, New York. It was my first experience living far from home and I loved it, but this story is not about the summer, it’s merely about one of the characters I met in Syracuse. Her name was Charlene and she was in her fifties, she was Kathy Bates mixed with Margo Martindale and a dash of Rue McClanahan thrown in for good measure. She was a member of the congregation and had an infectious laugh and warm heart. She worked as a caregiver for an elderly woman and she lived in that woman’s home. Years, later, when I read Stephen King’s Delores Claiborne, I thought about Charlene and the tales she told me working a similar job. In the first weeks of my internship, Charlene came up to me at church and told me she wanted to take me to lunch after the service. 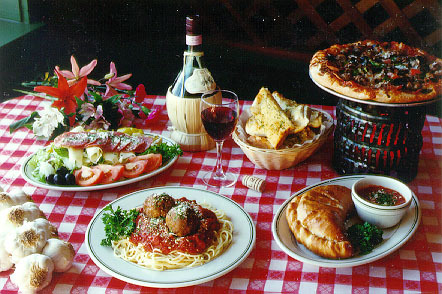 She took me to an Italian restaurant and told me to order anything on the menu that I wanted. She made sure I ordered an appetizer (fried ravioli) and a huge entrée (lasagna) and a dessert (death by chocolate) and even asked me if I wanted to order wine. “It’s okay if you want some wine, I won’t tell anyone.” I resisted, though I’ll tell you now, I was a bit tempted. The reason this meal lingers in my memory was the generosity with which it was offered. She wanted me to eat like a king. She told me not to worry about how expensive the meal was, it was something she wanted to do. She took me to this Italian restaurant two or three times that summer. If she had an ulterior motive, it never surfaced. I believed then and believe even more now, that she just wanted to do something nice for another person. It wasn’t until years later that I realized what a sacrifice these meals must have been for her. She did not even have her own apartment, merely a room in her employer’s house. She did not drive a new car, I don’t think she had a bountiful 401k. Now, of course, I am much closer to Charlene’s age than to the age of the boy, sitting there stuffing his face with fried ravioli. (It was good.) I’m certainly not as economically set as I’d like to be and some nights, I lie in bed worrying about my financial future. A few months later, in December of that year, I had an opportunity to do something nice for someone. In fact the someone in question was Charlene, she had quit her job and moved to Joplin to go to Ozark Christian College. While there were things she liked about the environment, I believe that being a 50-something non-traditional student living in dorms in an ultra conservative part of the country bore its share of challenges. But she was beloved on campus for her wit, kindness, and unfiltered opinions. At Christmas time, she did not have enough money to go home to Syracuse for the break. She couldn’t afford a plane ticket. It so happened, I had a $400 voucher from whatever airline I flew home on in August (I’d been bumped from my flight.) For months, I’d dreamed about how I would use that voucher. The day I talked to Charlene and she told me she wasn’t going home, I must say, it pained me a little when the idea of giving my voucher to her came into my mind. I thought about it for a day or so, and then I decided I’d let her use my voucher. (These were the days when vouchers were transferrable.) I’ll never forget how excited Charlene was when we drove to the airport to buy the ticket. She was so grateful. It’s 25 years later, I still don’t regret my decision. Whatever trip I could have taken would never have had the value that it did for Charlene. It’s kind of obnoxious that I’m telling you, bragging sort of, about an act of kindness that I committed so long ago. If I was truly humble, I wouldn’t share that part of the story, but the big reason I share the story is, I think generosity does not come naturally for many of us. Or at least it doesn’t come naturally for me. It’s something I have to work on, cultivate. And yet, if generosity was something that Charlene struggled with, I never saw it. So, now that I am a drinking man, I can raise my wine glass to toast a wonderful woman. Wherever you are, Charlene, you taught me a lesson in kindness that I will never forget. Yesterday, when I was perusing one of my favorite websites, New York Social Diary, (I’ve written about it here before) I came across the story of Elizabeth Wentworth Roberts. 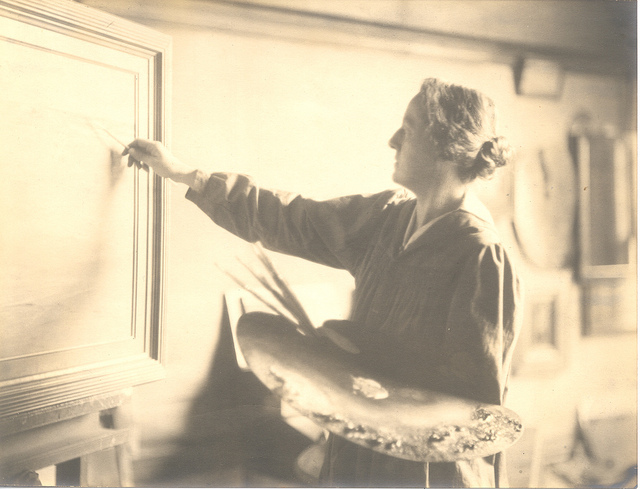 She was a prolific painter and co-founder of the Concord Art Association which still functions today. I’ve posted a few of her works here. From a wealthy Philadelphia family, she decided at 15, inspired by Mary Cassatt, that she would become a painter. She did become an accomplished painter and her contemporaries included John Singer Sargent, Claude Monet, Cassatt, Daniel Chester French (he sculpted the statue of Abraham Lincoln for the Lincoln Memorial), Childe Hassam and George Bellows. When she was in her fifties, she was diagnosed with “melancholia.” In 1925, her doctor told her it was in her best interest to stop painting. Not long after, she hanged herself. She was 56 years old. Hey, who doesn’t suffer from at least a mild case of melancholia? I’m sure the doctor or doctors had reasons for recommending Elsie retire her paintbrush, but it seems to me, that they failed her. Would she never have killed herself if she kept painting? I don’t know. I’m aware of the frustrations that arise from exploring our art, like hating what you’ve created or feeling that your art has been passed over or even creating something so great that after the crescendo, there is an emptiness and a question as to whether you’ll ever create something you are proud of again. But my position is and probably always will be, we need our art. It is what carries us through the hard times. So maybe today, you’ll do your art and think about Elizabeth Wentworth Roberts. She knew your melancholia, it was hers, too. And if someone encourages you to stop creating, I’m not a doctor, but I don’t think you should listen to them. When friends talk about all the keggers they attended during their college years, I always feel not a lot, but a little jealous. My Bible college did not condone drinking alcoholic beverages, it was cause for expulsion. I didn’t really think about it a lot, I didn’t pine for Chardonnay (then). I accepted the rules and believe me, my friends and I still had a lot of fun. But then there was one night. I think it was my senior year. Two of my friends and I were hanging out, I don’t remember what we were doing, maybe walking around Northpark mall, or getting frozen yogurt at TCBY, I don’t know. 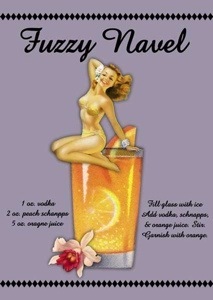 But one of us, out of the blue, suggested we go drink fuzzy navels. Was it me? Maybe. There is at least a 33% chance it was my idea. My friends, I will never reveal their names, not even now, agreed that it sounded like fun. We discussed the if’s, the how’s, the why’s, the when’s. We decided we would do it. “What the hay?!? !” So we drove to a liquor store and I bought a fifth of peach schnapps and then we drove to Dillons and bought a half gallon of Orange Juice. Then we drove around Joplin looking for a spot to drink our fuzzy navels. If I recall correctly, and I’m not saying I do recall correctly, we parked on a quiet road on the outskirts of town. And we made our drinks, probably the three weakest fuzzy navels ever made. In retrospect, I wonder what we drank out of? Did we have ice? Some details I don’t remember, but I do remember we giggled as we sipped our drinks, conjecturing about who had the most to lose if we got caught by cops. We felt like the sons (and daughter) of anarchy. “I think I’m drunk.” “Me too.” More giggles. After about an hour of this raucous heck-raising, we hightailed it home, promising each other we’d take our story to the grave. Yes, in a way, I’m breaking that promise, but like I said, I’m not naming names. So, in a way, we were typical college students, sowing our wild oats, or more accurately, wild oat. It was the only time I ever drank in college. Clearly, I’m not ashamed, but I am glad it was an isolated event. If it happened more than once, it wouldn’t hold in my memory the same special way. And even still, when I read or hear about a fuzzy navel, I think of those two friends, and I certainly hope the same goes for them.